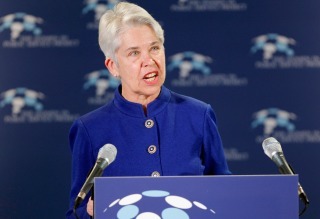 University of California President Janet Napolitano announced Monday that she has selected Carol Christ to be the new chancellor for UC Berkeley. Christ, 72, who formerly served as president of Smith College and currently is UC Berkeley's interim executive vice chancellor and provost, will be the university's first woman chancellor. The current chancellor, Nicholas Dirks, announced in August that he would step down to return to teaching and research once a successor is in place. The UC Board of Regents will vote on Christ's nomination on Thursday during a special session held concurrently with the regular board meeting at UC San Francisco's Mission Bay campus. If she's approved by the regents, Christ will become UC Berkeley's 11th chancellor, effective July 1. Napolitano said in a statement, "I am delighted that Carol Christ has agreed to lead Berkeley at this pivotal time in the campus's storied history." Napolitano said, "From among the many highly qualified candidates for the position, Carol's exceptional leadership and strategic planning skills, her deep commitment to the university's core values, her many academic and professional accomplishments, as well as her deep knowledge of, and affection for, UC Berkeley stood out." Christ said, "I feel honored and privileged to lead the campus at this challenging time. It is a small way to give back for everything the university has given me." She said, "My experience at Berkeley has been transformational; it formed my ideas of higher education, and it formed my ideals of higher education."